The President of the European Commission used his State of the Union speech to call for member states to adopt an emergency refugee distribution system, ignoring that his similar plan of a lesser scale was rejected last May. EURACTIV France reports. The violence of the refugee crisis may force Europe to overhaul its asylum policy. For Juncker, who hopes to convince EU member states to accept the mandatory distribution of 160,000 refugees, this would be a positive step. In order to achieve this, the Dublin Regulation, which forces refugees to apply for asylum in the first EU country they arrive in, and is often accused of destroying solidarity between EU countries, would have to be altered or suspended. Such an ambitious policy would require a fundamental change in attitude among EU leaders, who in May refused a similar distribution plan for just 40,000 refugees. In his first State of the Union speech to the European Parliament in Strasbourg on Wednesday (9 September), Commission President Juncker asked member states to show more solidarity, and pointed out that the influx of refugees represented “only 0.11% of the European population”. French radical left MEP Marie-Christine Vergiat added that in the developing countries affected by the crisis, refugees average 13% of the population. The urgency of the migration crisis will force the EU to review the list of safe countries of origin and examine the system of distribution for asylum seekers, two issues that have been blocked at European level for years. “I invite member states to adopt the Commission’s proposals on the emergency resettling of 160,000 refugees during the extraordinary meeting of the Home Affairs Council on 14 September,” Jean-Claude Juncker said. This figure includes the 40,000 refugees rejected by member states in May, as well as a further 120,000 that have recently arrived through Greece, Italy and Hungary, the EU’s main entry points. Germany (31,443) and France (24,031) would shoulder the bulk of the burden, followed by Spain (14,931), Poland (9,287) and the Netherlands (7,214). The United Kingdom, Ireland and Denmark, who have opt-outs for migratory issues, do not figure in the Commission’s refugee distribution plan, but would be free to participate on a voluntary basis. British Prime Minister David Cameron announced this week that the UK will take in 20,000 Syrian refugees over the next five years; an effort many have criticised as far from sufficient. But Cameron insisted this was a sovereign UK decision, and had nothing to do with the Commission-proposed quota system of burden sharing. A number of EU countries are against the mandatory quotas, some of them saying that they cannot host large number of refugees. As a gesture to them, the Juncker plan foresees a “temporary solidarity clause” which allows the respective country to pay a sum to the EU budget, instead of receiving its share of refugees. “If – for justified and objective reasons such as a natural disaster – a Member State cannot temporarily participate totally or in part in a relocation decision, it will have to make a financial contribution to the EU budget of an amount of 0.002% of its GDP”, the Juncker plan says. The financial contribution is not heavy. EURACTIV has calculated that if Poland refuses to take refugees, the sum it would pay to the EU budget is of €10.5 million. On top of the emergency distribution system, Jean-Claude Juncker also called for the establishment of a permanent relocation mechanism for refugees in Europe, which could be invoked in future crises. Such a system would allow the commission to bypass the Dublin Regulation without the need to reform it. Another major change Juncker proposed in his the State of the Union speech was to review the list of countries officially recognised as ‘safe countries of origin’. This should allow the EU’s national asylum systems to deal with certain applications more quickly. “But that will not change the right to asylum for citizens of these countries,” the head of the executive said. Asylum applications from the citizens of these 7 countries account for around 17% of the total, according to the Commission, but only a very small percentage of these applications are valid. In 2014, only 3% of asylum applicants from Montenegro were eligible. 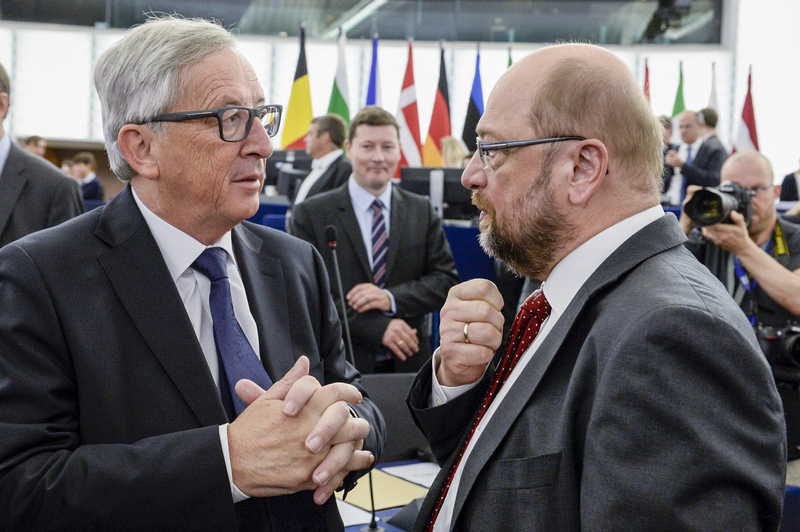 Commission Vice-President Frans Timmermans appealed to MEPs to back the proposals, in order to give the package the best possible chance of being adopted during the Home Affairs Council on 14 September. The European Parliament will make its decision on 10 September in Brussels. Supported by Germany and France, the Commission’s proposals will face hostility from eastern European countries and the United Kingdom, which has ruled out the idea of refugee quotas. Beyond outlining the emergency measures he hopes member states will adopt, Jean-Claude Juncker also announced his intention to review the EU’s migration policy early next year, and to propose a package of reforms to legal channels of migration into the bloc. “Migration should gradually stop being a problem to solve and become a well-managed opportunity,” he said. In a speech in the Bundestag yesterday, Merkel welcomed the Juncker plan, adding that even more ambitious and binding agreements were needed. Since 1999, the EU has worked to create a Common European Asylum System and improve the current legislative framework. New EU rules have now been agreed, setting out common high standards and stronger co-operation, to ensure that asylum seekers are treated equally in an open and fair system – wherever they apply. But EU countries rejected the Commission's proposal that asylum seekers from the countries mostly affected from the arrival of migrants should be relocated in other EU member states. The number of migrants entering the European Union illegally in 2014 almost tripled to 276,000, according to EU border control agency Frontex, nearly 220,000 of them arriving via the often dangerous Mediterranean crossing. The chaotic situation in Libya has sparked a rise in migrant boats setting out for Europe from its unpoliced ports carrying refugees fleeing conflict and poverty in the Middle East and Africa. In 2013, Italy’s previous government initiated the search-and-rescue operation "Mare Nostrum" or "Our Sea" after hundreds drowned in an incident off the coast of Lampedusa. But Italy scaled back the mission after failing to persuade its European partners to help meet its operating costs of €9 million a month amid divisions over whether the mission was unintentionally encouraging migrants to attempt the crossing. That made way for the European Union's border control mission, Triton. However Triton, which has a much smaller budget and narrower remit, has been criticised by humanitarian groups and Italy as inadequate to tackle the scale of the problem. Democracy in Europe is dead, All Hail Caesar Juncker. There is an urgent need for the citizens of the EU to have a voice on the matter of the Commissions tardy action on immigration. Do we have a way of ensuring the Commission and its officials can be heavily censured for the current6 situation. The Commission has still not got the situation under control and is playing catch up. I want the Fuhrers head for this and also that of his Reich marshalls. juncker keeps saying the 500 million people in the EU …. this needs correcting because whilst he thinks he has 500 million.. 500 million did not vote or support the EU or him. he should only use the figure for those that actually support the EU by voting in the EU elections. … it was not 500 million so juncker is in fact is wrong. just look at the figure for the turn out in the last election. Just shows how desperate the federalists are getting with 30-50% Youth unemployment in most EU nations & this fool says we are an aging population in decline that needs mass immigration. It’s another one of their flagship policy’s ‘open boarders’ that has backfired on them as predicted causing mass immigration they can’t stop but instead of re-establishing boarder controls they are trying to protect their dream. Farage was right these are dangerous fanatics. The EU is falling apart & this is his last ditch attempt to hold it together forcing millions of YES votes into non complainant country’s changing them forever hoping it will tip the balance back to towards them. The only reason Europe has an ageing population is the foolish fuhrer junker makes things so damned expensive and does not create real work for people so they can buy a home and start a family. Instead he brings in yet more to live on benefits so he and his so called council can prance about virtue displaying leaving their own people to rot. The differences over equitably quota based sharing of refugees is a mild pointer to cracks within the EU because these seem to be marking different path of functioning within the same organisation though mere differences need not necessarily be a sign of cracks. This writer had predicted such a situation to come into being in article – ” Total lunar eclipse of 28 September 2015 and world” – published in Summer 2015 ( June) issue of The Astrologer’s Notebook, a quarterly print publication from North Port Florida. While covering prediction of circumstances or events to take place during second half of present year 2015, this writer had said : ” Associations or unions having common aims, could weaken at vulnerable situations and may even disintegrate”. Though it can’t be said that EU is disintegrating, yet the pointers which are probable from the goings on suggest weakening of the EU if finally different paths are adopted. Readers may like to know these predictions. Juncker and his Commission and the Council are telling lies to the European People and hiding what is going on.